If you need to pay a bill or an individual but don't want to carry cash or use a bank check or credit card, a money order is your best bet. Filling out a money order is similar to writing a check. You'll need to know the payee's name, the payment amount, the payee's address, and any other relevant details such as an account number. Each money order issuer varies slightly. For example, the United States Postal Service (USPS) and Western Union money orders have a different format. When you purchase a money order, you provide the amount to the vendor. The paper document you receive will include the amount, so you won’t need to fill in that information. Payee information: Write the name of the person or business you are paying with the money order. This section might be labeled "Pay to the order of" or "Payee." Avoid making money orders payable to cash, as you risk losing the funds if the money order gets lost or stolen. Address information: Some money orders have space for you to provide your mailing address in case the recipient needs to contact you about the payment. However, if you’re worried about your privacy, you might be able to omit this information. Ask the money order issuer and the recipient what is required. For USPS money orders, the address section on the left is for the recipient’s address, while other money orders typically use this space for your address, so both the recipient's address and your address are included. Additional details: You may need to include additional information on the money order so that the payment is handled correctly. For example, write your account number, transaction or order details, or any other notes that will help the recipient recognize the reason for the payment. This section may be labeled "Re:" or "Memo." If there’s no space for additional information, write it on the front of the document. Signature: Some money orders require a signature. Look for a section marked "Signature," "Purchaser," or "Drawer" on the front of the document. Do not sign the back of the document because this is where the recipient signs to endorse the money order. After you have completed filling out your money order, keep any receipts, carbon copies, and other documents you received when you purchased it in case there’s a problem with your payment. You may need these documents to cancel the money order, and they can be helpful when tracking or confirming a payment. For buyers, money orders are a safe way to make a payment. You can mail a document that can be tracked and cashed only by the intended recipient. 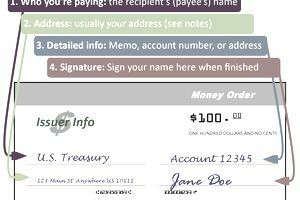 Compared to checks, money orders help you keep certain information private, such as your bank account numbers, home address, and even your name. If you need to buy a money order, you can get one at various places including Western Union, Walmart, or a regular bank. They cost about one dollar at most retailers, but you'll pay slightly more at your bank or a credit union. For sellers, money orders usually are a safe form of payment. Buyers must use a cash equivalent to buy a money order, so it can't bounce like a personal check. Money orders are sometimes faked and used in common online scams, so it's best to make sure they clear your bank before spending the money. While money orders are a popular, inexpensive payment method, you might want to research other forms of payment. For example, large purchases may require the use of several money orders because of dollar amount limitations and fees. Thus, in this case, a cashier's check might be a more suitable form of payment. Money orders are not a substitute for a regular bank account, which allows you to write your own checks or use a debit card. Unlike check or debit card payments, you'll be paying a money order fee every time you make a payment.